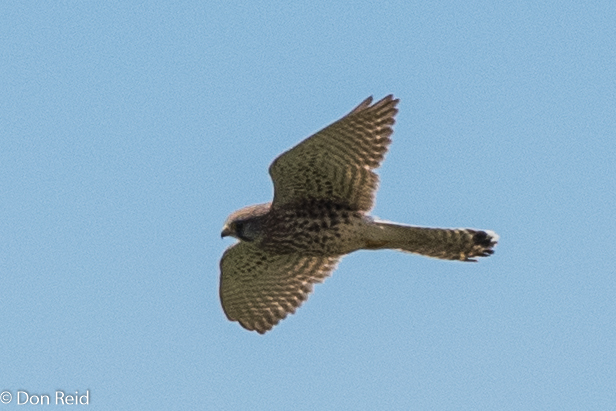 Formal bird atlasing * (see end of post) has become my priority when planning a birding outing and I was looking forward to completing my 500 th “Full Protocol” atlasing card, having completed 499 by the end of March this year. With Monday 2 April this year being a public holiday, it seemed the ideal time to reach this milestone and I targeted two pentads to the west of Mkhombo dam, a little more than an hour’s drive north of Pretoria, which I suspected would provide good birding in attractive surroundings and should be lush and green after the recent good rains in the area north of Pretoria. I was up at 4.20 am (after hitting the snooze button twice without even realizing it), collected good friend and equally keen atlaser Koos Pauw and headed north on the N1 highway, already busy on the homeward side with returning holiday and Moria pilgrimage traffic. The Rust der Winter turnoff soon loomed and before long we were on quiet country roads as the light grew stronger – a detour took us in the wrong direction initially but we were soon into the first pentad for the day. 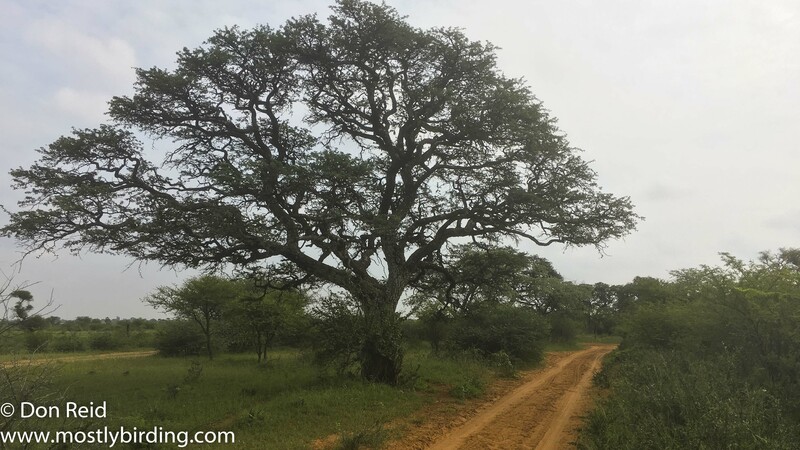 The dusty rural village we had entered was not very inspiring as a place to start our atlasing but just outside the village the habitat changed to patches of arid bushveld which, once we had stopped to investigate, proved irresistible for atlasing. All it took was to hang around at a selected spot long enough to allow the species to show – and show they did – all the species that favour the drier bushveld habitat : Yellow-billed Hornbills flying in their ponderous fashion from tree to tree, Crimson-breasted Shrikes with their redder than red breast colouring contrasting with jet black uppers. 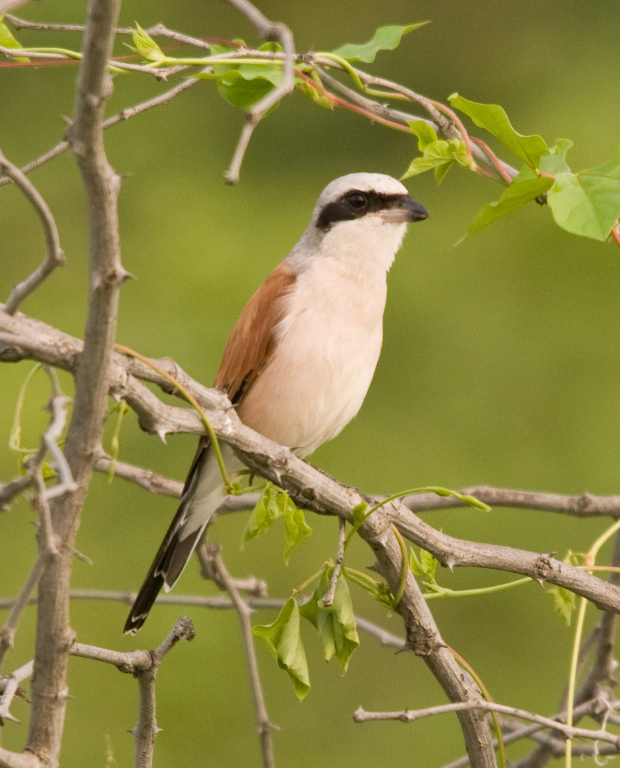 This area rates as excellent for Shrikes judging by the variety we encountered, with White-crowned Shrikes, Red-backed Shrikes, Lesser Grey Shrikes and even Magpie Shrikes all easily seen during the morning. 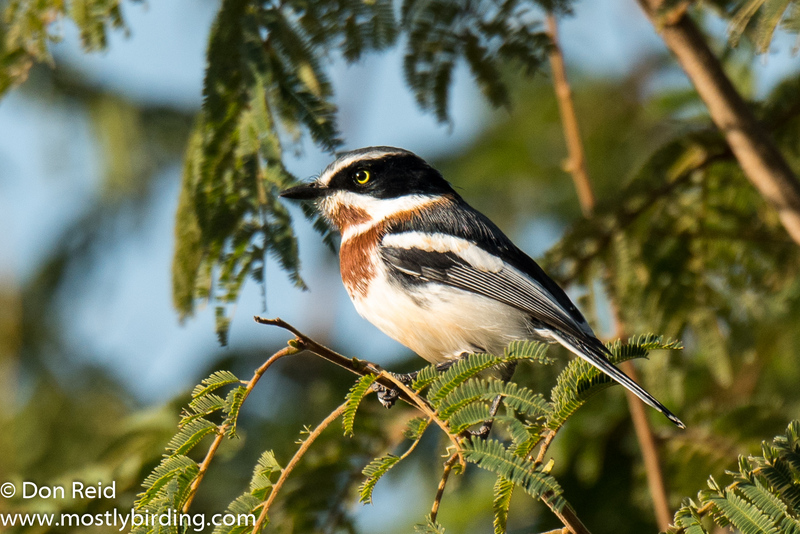 In between sightings we were able to identify several birds on their calls, familiar ones such as Acacia Pied Barbet, Chestnut-vented Titbabbler, Rattling Cisticola and the ubiquitous Go-Away Bird uttering its nasal “go away” call at every opportunity. 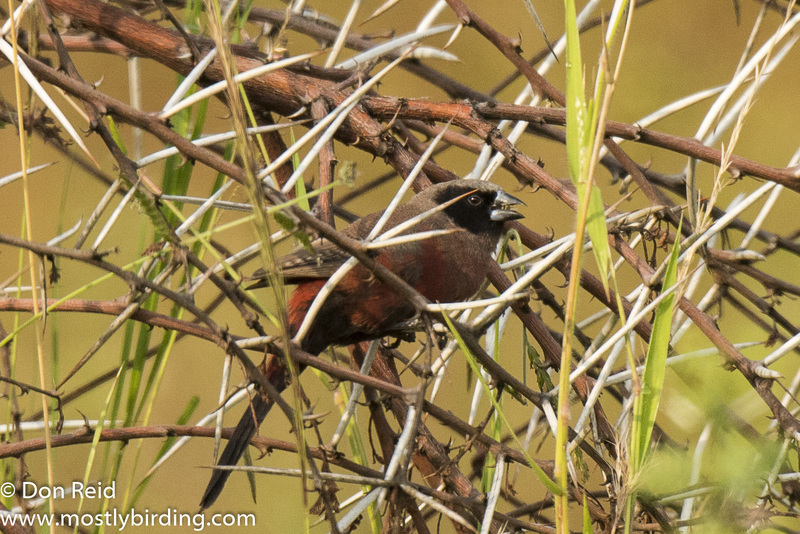 With the obvious birds recorded on our list we started picking up the smaller, “passer-by” species – Amethyst Sunbird, Chinspot Batis, White-bellied Sunbird, Black-faced Waxbill and Green-winged Pytilia (Melba). 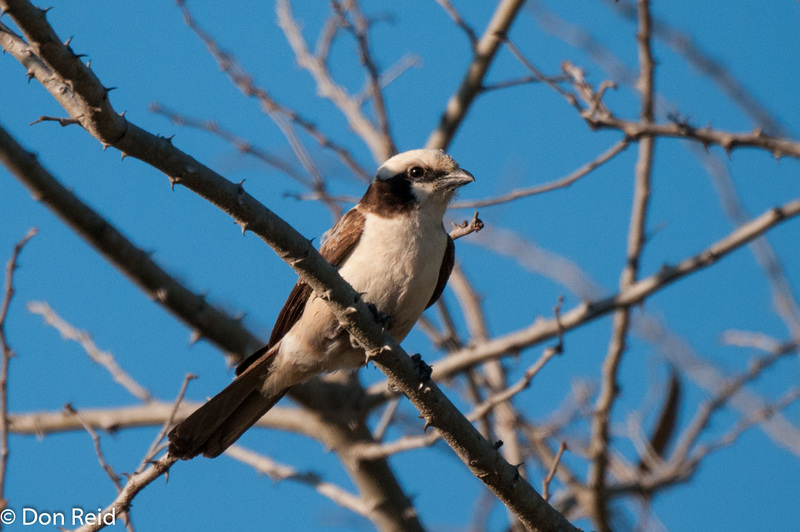 The species we came across most frequently were Marico Flycatcher and Scaly-feathered Finch (love its Afrikaans name Baardmannetjie – literally small bearded man, alternatively Koos calls it Fu-man-chu). In the villages Pearl-breasted Swallows dominate amongst the swallows for reasons unknown – perhaps they just like being around humans like many other bird species. The village we drove through looking for the species that seem to favour this habitat, was suffering from some “land-grabbing”, but not the sort that dominates our news from time to time – here the only tar road bisecting the village was slowly being “grabbed” by the surrounding sandy earth and undergrowth, so much so that there was barely a single lane width of the two-lane tar road still visible – so much for maintenance. 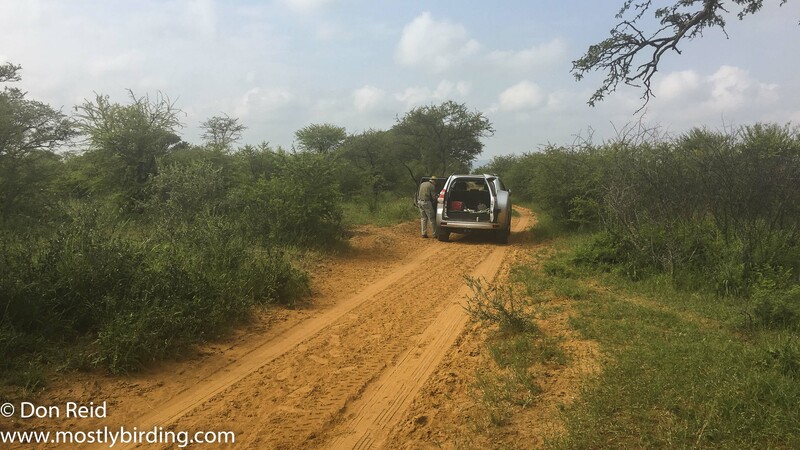 With our two hours of atlasing done (the minimum for a “Full Protocol” card), we headed to the main target for the morning, being Mkhombo Nature Reserve which lies to the west of the main dam. Entering the reserve’s gate, which lies a distance off the main road and is not signposted, we were met by the hoped-for pristine bushveld and sandy tracks with some thorny bushes encroaching in places – a tad worrying when the first screeches of thorn against duco rattled the control-freak side of my nature, but after some initial teeth-clenching I decided to ignore it – after all, why have a bush-capable SUV if you don’t want to go into the bush with it. We had the place to ourselves and enjoyed Koos’s hard-boiled eggs (well actually a chicken produced them, he just boiled them) and coffee in the tranquil surroundings while continuing with atlasing, then proceeded slowly along the sandy roads, branching off here and there for a view of the dam, which was pretty much non-existent other than a small pond or two. No other water was visible, just a vast expanse of green vlei grass covering the muddy plain as far as the eye could see, confirming how little rain the area had experienced over the last couple of years since we were last there. 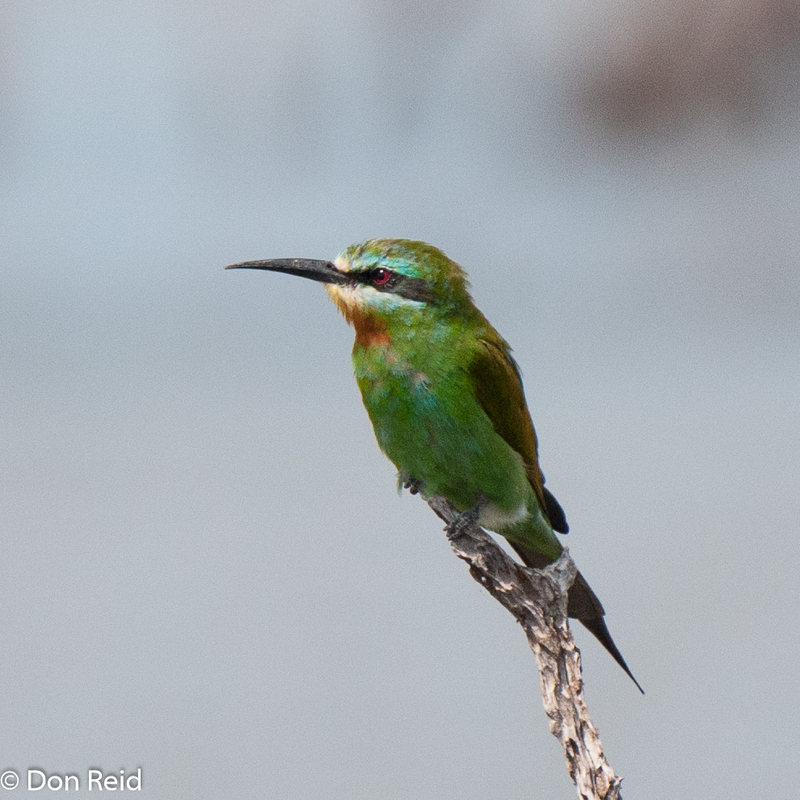 We were rewarded with Blue-cheeked Bee-eaters in a nearby tree, while Great and Yellow-billed Egret as well as Grey Heron were ID-able once I had the scope up and focused on the distant scattered birds. All three local Lapwings – Crowned, Blacksmith and Wattled – were visible, in separate groups but mingling where they overlapped, then I spotted a mixed flock of large birds in flight, morphing into Spurwinged Geese and Knob-billed Ducks as they landed in a hidden patch of water, with just their top halves showing. We had completed two hours and made our way back to the gate then homewards, which took a lot longer than planned as we encountered heavy holiday traffic all the way back. I basked in the pleasure of a milestone reached – here’s to the next 500! 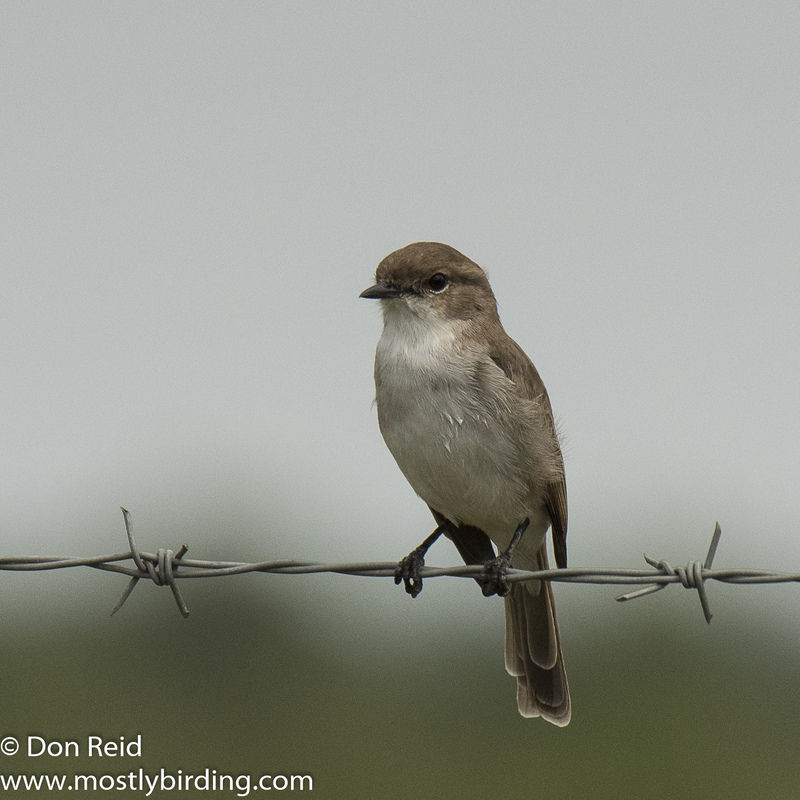 WHAT an interesting birding outing – and enviable photographs! 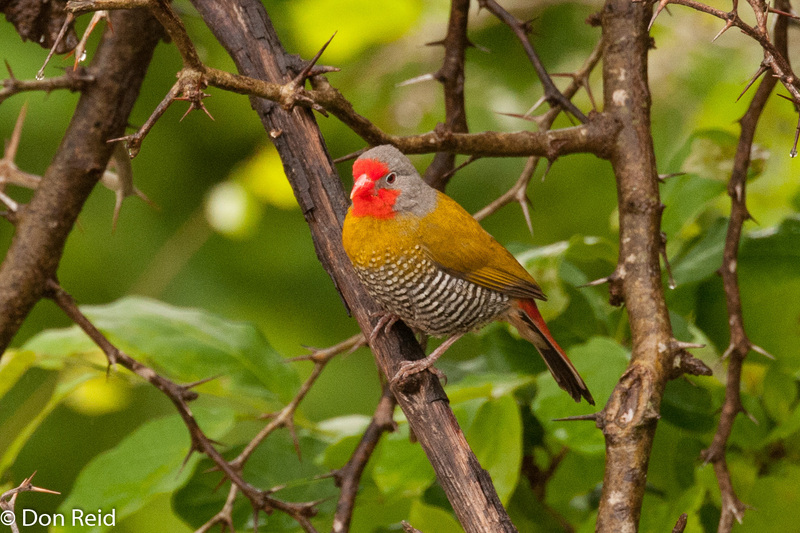 It was – the reserve is not well known at all but a great birding destination. Well done! I must get back to atlassing. Was eagerly involved in the first atlas, years ago. Then kids came along and ‘acted scarecrow’!! Back then the frog atlassing was simpler than the bird atlas: Tape the frog call; Write down the GPS co-ords; Send.